Davesgonechina at Mutant Palm posted a link to a set of historic maps from the map collection "hundred years of humiliation". The topic of humiliation is a complicated one. It could drive one to work hard on the one hand (to reclaim the old glory) but it could also lead to a sense of insecurity and in turn a whole series of mishaps amidst the urge to catch up (as China has gone through during that 140 years, i.e. 1940-1980). The most tragic example being that of Great Leap Forward. In short, it is no different from the case where some gambler who lost a small fortune in either the casino or the stock market and wanted to reclaim the lost land with highly leveraged (and hence risky, and often irrational) bets. No surprise he ended up lost a bigger fortune. A good training against irrationality is to learn to play the game of bridge, where decision making should purely be based on statistics and consistency, as Deng Xiaoping has learned and also practiced. The rule is the same as what you have learned in your high school probability class, that each event is independent of the previous one and hence each decision should be make independently and rationally, no matter what has happened before this very moment. This is also why Deng has left the words of Taoguangyanghui to his sucessors. TGYH is indeed the most rational choice for China for the next 50 years, or perhaps, forever. It does not really mean hiding low. What it really means is that, when you manage yourself well, good things will come; and all you have to (and should only) bother is to manage your own country well. So much digression, what I want to talk about is actually on geography. I had been to the city of Shanghai like a 100 times, and have heard about the French Concession in various books, movies and TV dramas (the Bund 上海灘 being the most famous one). 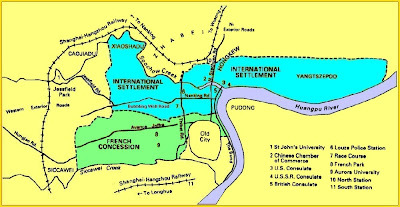 I know Huaihai Road = Avenue Joffre and that but I didn't know where the exact boundary the concession was. My rule of thumb is those roads planted with London Plane (法国梧桐) are inside the old French Quarter. 9) Aurora University has now been moved to the North, known as Fudan Univ. Century of humiliation is hardly an apt term for a nation that has seized control of its own destiny. Perhaps century of weakness is better? China was, first, a victim of her own self-absorption and then inability and slowness to re-invent herself; this allowed her depredation by others. It is more useful for Chinese people to recognise China's own inadequacies that made her fall from grace. A fixation with the misbehaviour of historic bullies serves no real purpose in itself. Besides, there is no reason to feel humiliated or angry over the past (Yasukuni excepted). China today has a good future. I think we all agree with you.